Welcome to my blog today as I share a super sweet card I created using some of my favorite products from Paper Sweeties. There isn't a "new release" this month, and that's because all of us at Paper Sweeties really just wanted to remind everyone (including ourselves) how much we LOVE all the sweet products that are already available in the Paper Sweeties Shoppe and revisit them. So...for this card, I chose to make a card that uses several such items. I started with some sweet patterned papers that I inked. I cut a Large Oval Scalloped Frame from a wood-grain paper and used it to frame the ADORABLE Emma. I stamped Emma in black ink onto a piece of white card stock and colored her with my Copics, and I then cut her out using the coordinating Emma Sweet Cut. She needed a cute outfit to keep her warm, so I stamped her coat, mittens and boots onto different patterned papers using the Let It Snow Stamp Set. 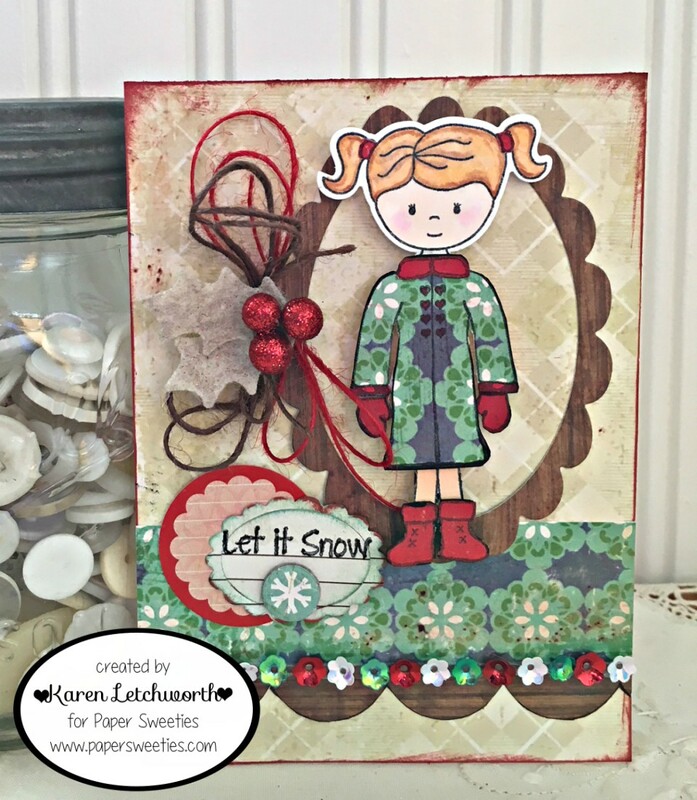 Once she was all clothed in her adorable outfit, I added a sentiment (Let It Snow) from the Let It Snow Stamp Set. That is also on a smaller oval from the Oval Scalloped Frames Sweet Cuts. I also added some burlap strings (brown and red) with some berries and then I accented them with some sweet holly leaves cut from oatmeal wool felt using the lovely Meet Me Under The Mistletoe Sweet Cuts. And finally, the bottom of my card is framed with a scalloped border from the Sweet Borders Sweet Cuts and lined with Strawberry Sequins, Green Apple Sequins and Marshmallow Sequins. Thanks again for stopping by. I hope that you will visit again tomorrow when I share another super sweet Paper Sweeties project with you all. Have a blessed week! 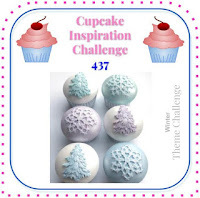 Simon Says Stamp Wednesday Challenge Blog - Simon Says "Use patterned Papers" - I almost always do. 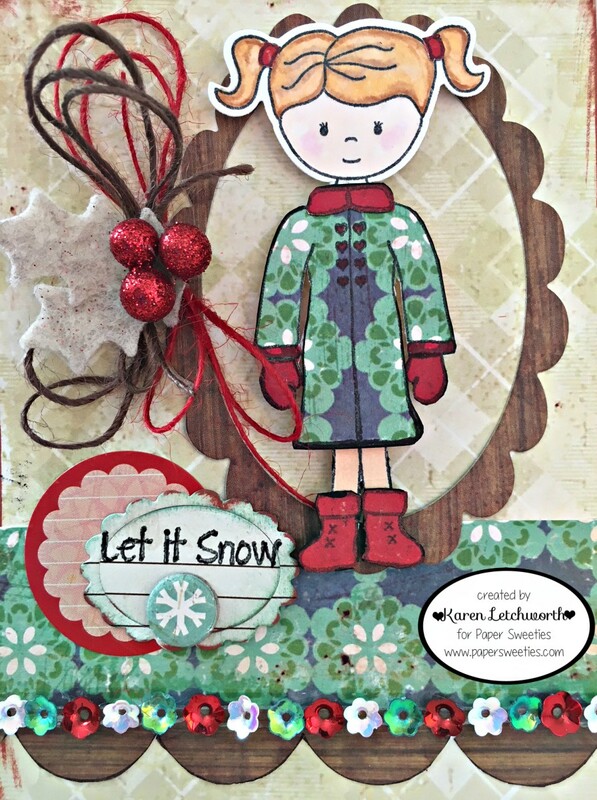 These patterned papers are from Crate Paper's Peppermint Collection. Karen, what a fun card. Love all your details especially the sequin flowers. Such a pretty card, Karen! Love the colors and your pretty paper pieced Emma! Blessings to you...Happy Sunday! Emma is so cute in her winter outfit! Lovely patterned paper and fab row of sequins! Emma looks ready for winter in her pretty coat! Great card! Beautiful, Karen! Love Emma's patterned coat that matches the border! Hugs! This is adorable! LOVE her coat and boots and that row of sequins is precious. Super creative and fun card. Such a sweet card!! Love all the pattern papers you used. Thank you for sharing with us at Cupcake Inspiration Challenges.